Eatiful: Rhino Cafe: Free food! This post is going to include my first and second visit to Rhino Cafe at Lansdowne Mall. I ate at Rhino Cafe within the first week that it opened. I remember finding the cubicle-like seating arrangement strange because they weren't booth seats, just simply black walls put up to block customers from seeing each other. There were several TVs and rhino stencils on the walls which some people might find interesting to look at. With the plastic chairs and bright blue walls I find it a little bit like a kids showroom in IKEA. Anyways, I only have one picture from the this visit. I had the Unagi Toast which came with some greens on the side. I suppose the dish is Japanese inspired with unagi and cheese baked on toast and then covered in seaweed, mayo, sweet sauce like on takoyakis. It did taste pretty good but this was the only memorable dish from that meal (hence no other pictures). However, I could not find this item on the menu on my second visit so I think they might have removed it. I didn't have any intention to return to Rhino Cafe after my first visit since it was a bit pricier than other cafes that serve similar food and there are always so many new ones to try! I returned today for lunch because a friend said their menus have changed. This is the all Chinese menu but you can request for an English menu. Sorry the shot is not very clear but basically most of the dishes are either rice or noodle based. Unlike my first visit, this time the restaurant was quite full at noon and we even had to wait for about 5 minutes for a seat. The man in the picture seemed to be the manager to all the employees, he was always talking to different customers making sure they liked their food. There's a random tree trunk in the middle of the restaurant. I ordered a lunch combo which included a choice of rice/noodle dish and a hot drink ($7.95). I opted for the Baked Portuguese Chicken Rice and added $1.95 to substitute a Red Bean Ice Drink. This baked rice was actually pretty good, there was lots of sauce so the rice was not dry. The sauce was not spicy and tasted like mild curry with coconut milk. The rice was stir fried slightly with egg and on top were pieces of chicken (thigh meat) and potato. It came hot and there was probably two cups of rice in this bowl so it was very filling! I appreciated this red bean drink because it was not filled up with huge ice cubes that take up a lot of space which is common in other restaurants. Instead it was mostly tender red bean with sugary milk and shaved ice on top. This is the seafood and rice noodles in lobster soup ($8.95). There was plenty of rice noodles and a good amount of imitation crab, shell-less shrimp, tofu, fish, scallop, and bok choy. There are no actual lobster pieces but the soup base tasted like lobster. 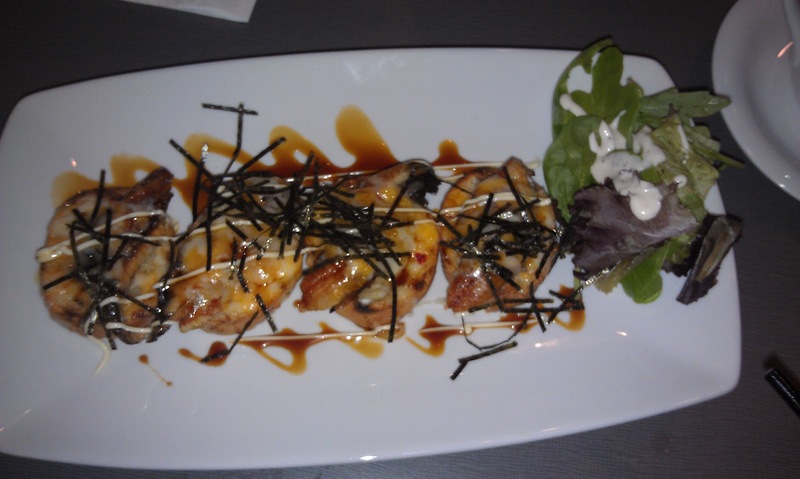 This tasted good and the ingredients used were a good mixture, I especially liked how the shrimp was completely shell-less which makes it much easier to eat. Special deal: If you order this noodle soup, they will give you a free coupon for the same noodle soup the next time you dine in. My coupon is valid June 1-30, 2012 so I'm not sure if they will continue this deal for the next month. It's a business strategy but anyhow it is appreciated by customers. There is another noodle soup and steak combo that also has this buy one get one free deal. This is the Afternoon Tea Special menu that was not there during my first visit. Overall, I will probably be visiting Rhino Cafe again in June to use my coupon and to eat the Stuffed Sticky Rice Chicken Wing I mentioned in my Top Gun J&C post. The new menu is definitely more competitive among the surrounding restaurants than the old menu. Its ratings on Urbanspoon are really poor at 28% likes (as of May 30, 2012) but I think it deserves better because the food is actually pretty good and the value has improved! Just a quick note that Rhino Cafe is CASH ONLY.